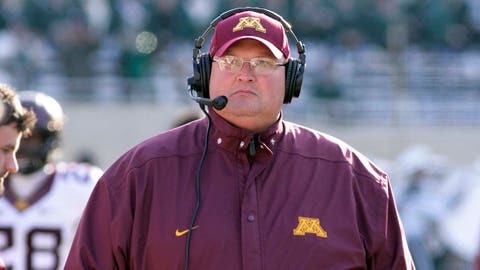 Given the progress Tracy Claeys has helped the Gophers make in this staff's third year at Minnesota -- especially in a more pivotal role over the last six games -- he hasn't needed to promote himself. MINNEAPOLIS — The head coaching offers will surely come Tracy Claeys’ way this offseason. In fact, the Gophers’ defensive coordinator admitted he’s already received one such proposition during the regular season. Claeys has made a name for himself the last few months while leading Minnesota’s football team as the acting head coach. Since third-year head coach Jerry Kill announced he would take time away from the program to focus on his epilepsy, Claeys has been the guy in charge. He’s been down on the sideline on game days and he’s called the shots in the heat of battle as the Gophers went 4-2 in their final four regular-season games. While Claeys’ success has been good for Minnesota, it could soon benefit another school. As with any head coaching opportunity, the financial reward would no doubt be appealing, but an offer would have to be a good fit for Claeys to take it. Complicating the issue for the 44-year-old Claeys, though, is the fact that he’s been on Kill’s staff for 19 seasons. That sense of loyalty is not unique with Claeys. Most of Kill’s staff has moved with him as he’s progressed up the ladder to increasingly more lucrative jobs. Kill considers himself fortunate to have not had many conversations with assistants about leaving him for another opportunity. Yet at the same time, Kill would have no hesitation giving a positive job reference for anyone on his staff. Claeys says he refuses to hire an agent and opts not to promote himself when various job opportunities arise. He instead wants his performance to speak for itself. Given the progress he’s helped the Gophers make in this staff’s third year at Minnesota — especially in a more pivotal role over the last six games — he hasn’t needed to promote himself. Kill’s players have raved about playing for him over the last three years, even the ones who weren’t recruited by him. As Kill has suffered health issues during his three years, his players have always been behind him and supported him through the tough times. But it’s clear that Claeys has garnered a similar amount of respect from those same players. They see the loyalty and camaraderie that the staff possesses, and they feed off of it. Since taking time away from the team, Kill has watched Minnesota’s games from the press box while Claeys has roamed the sideline. It was a transition that initially took some getting used to for Claeys, but he admits he’s since come to enjoy being around the players when the competition ramps up on the field. It’s uncertain at this point whether Claeys will be on the sideline on Dec. 27 when Minnesota plays Syracuse in the Texas Bowl or if Kill returns, although it’s likely that Kill will once again be up in the coaches’ box. Regardless of where Claeys is for the bowl game, there’s a chance he could be on the sideline again real soon. In the world of college coaching where so many jobs open up on a regular basis, it’s not unusual for coaching staffs to experience a decent amount of turnover from year to year. That hasn’t been the case, however, for Kill during his time at Minnesota as the staff has remained firmly intact since he took over the program in 2011. In a matter of a few weeks, that could certainly change if Claeys decides that the timing is finally right for him to leave his close friend’s program to run one of his own.